Croke Park Agreement? Massive severence packages for early retiring civil servants? It’s all Simon Harris TD’s fault. A vote for Simon Harris is a vote for extra pay for ministerial advisers. Not happy with the Croke Park Agreement? How about extra pay for special advisers to ministers? Huge severance packages for retiring civil servants? Reducing the Dail by a minuscule 8 TDs? Letting civil servants retire early on gold plated pensions and then rehiring them? It’s Simon Harris TD’s fault, and if you vote for him at the next election, or even give him a preference, you are endorsing all of the above. Why? Why am I picking on the Fine Gael TD for Wicklow? What have I got against him? Nothing, as it happens. 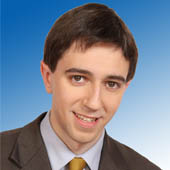 I have never met the man, and I just picked him at random as the representative of the new class of government TDs. But I will tell you something about him. Like many of the young first timers elected for Labour and FG in 2011 he went in promising a new politics, including opposition to a lot of the sort of stuff above. Has he voted in the house against this stuff? No. So he is in favour of it. Ah here, says you, that’s a bit unfair. Sure he’s only one guy. Yes, he is. As is Eoghan Murphy and Aodhan O’Riordan and Pascal Donohoe and a rake of other young men and women who when you put them together make up the government’s majority. But they have to obey the whip, says you? Really? Where’s it say that in the constitution? More to the point, where did they say that in their election literature? “Vote for me so I can go to the Dail and shut the hell up and do what I’m told.” Where did it say that, exactly? When they were getting friends and family to knock on doors for them were they saying that to them? In the United States, a congressman or senator gets held to account for how they vote on issues. Simon Harris promised a new politics. If he is unwilling to implement it, then we the voters should do it for him by holding him to account for refusal to vote against massive severence packages and the Croke Park Agreement. It’s his record, after all.